To get lxc installed on your system, you can install the LXC package from your distribution's package manager. I started with a default installation of Fedora 23 Server Edition. After updating everything with dnf, you can install LXC. We want to create an unprivileged container so that we do not have to run the container as root. In case an attacker is able to compromise the container and break out of it, we do not want him or her to have root access on the host. lxc-create is the command to create a container. -t specifies the template we want to use (we saw the list above) and -n allows us to specify a name for the container. Substitute containeruser for the username of the user that will be running the containers, and subsitute the first subuid and number of subuids that I have if you want something different. Make a file with the same line and save it as /etc/subgid. These two commands will add the specified subuids and subgids to your user. Bash (if you are using bash) will substitute your username for $USER when you run the command. Make sure the numbers you specify here match the range in /etc/subuid and /etc/subgid that you created. Next, we are going to get networking for our containers set up. We are going to set up a bridge that lets us talk to the containers (and gives the containers a network to talk amongst themselves). To do this we need two packages: dnsmasq (to do DHCP for the containers) and bridge-utils (to set up the bridges). On my installation, they were already there, but just in case they are not, the command above will add them. Since we want DHCP for our containers, we need another systemd unit file to get that set up. 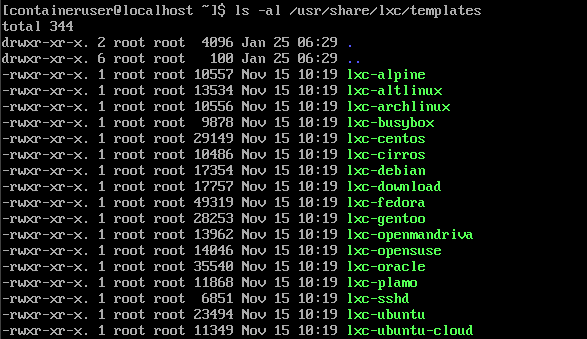 Create the following as /etc/systemd/system/lxc-dhcp.service. # This unit file depends on the bridge (lxcbr0) being up. The last thing we need to do for networking is set up the firewall rules to allow traffic to and from our containers. For that, we will add a new 'LXC' zone to our firewall and allow traffic out. For your use case, you will need to further lock things down. The final thing we have to do for networking is enable forwarding in the kernel. We do this via sysctl. Substitute the user name I am using (containeruser) with the user name you are using. veth tells LXC we are going to use virtual ethernet interfaces. The bridge we created is lxcbr0, and we will create ten virtual interfaces on the bridge. This next part is a bit tougher. Since support for unprivileged containers is so new, not every distribution has the tools necessary to make it work. To complicate things, systems using systemd need special tools to manage things like cgroups (since systemd controls cgroups). We will need to install two packages: lxcfs (which makes storage cgroup aware) and cgmanager (which allows for better management of cgroups). As of this writing, neither of those packages are available from any Fedora repository that I could find. Therefore, we need to build them from source. I normally do not like to build things from source that the system will depend on because I like to have the convenience of a package manager to keep the packages up to date for me. Hopefully soon, these packages will be available in other distributions (they are available in Arch and Ubuntu). To get started, we need to install the build tools so we can build the packages. If this box is going to be exposed to the internet or some other untrusted network, get rid of these tools when we are done. We do not want to give an attacker a means of compiling arbitrary code on the box. Sure, they could get root and install the tools, but hopefully you would notice that. Next, we need to install cgmanager. That has a few dependencies of its own. We need to build one of them from source (libnih 1.0.3). Fedora ships with libnih 1.0.2, but cgmanager needs 1.0.3. On my system, cgmanager was installed to /usr/local/sbin/cgmanager. The systemd unit file is pointing at /sbin/cgmanager. You can either make a symbolic link in /sbin/cgmanager or change the unit file to point at /usr/local/sbin/cgmanager. I changed the unit file. Unfortunately, I have to run this every time a container is started. Does anyone have a solution for that? 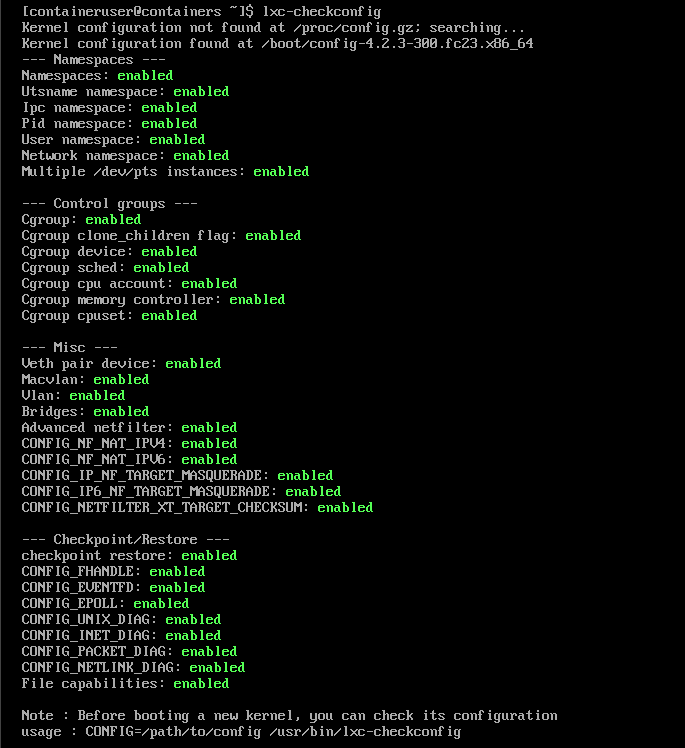 I tried freezing the configuration with cgm (see the bottom of the man page here), but that did not work. Unprivileged LXC templates are designed a bit differently than the normal LXC templates, and they do not ship with LXC, so we need to download them from the LXC project to be able to use them. We create the directory in .cache to save these templates as we download them so that we do not need to download the same template every time we want to create a container from it. Now, we will make the default container configuration file. We need to tell LXC what subordinate UIDs and GIDs to use, and we need to set up networking since we want our containers to have network access. Then you have ACLs enabled. If you do not, you need to add them under /etc/fstab for your mount point. Usually, the line in /etc/fstab will have something like defaults 0 0 at the end. Simply add acl to the list of mount options (like defaults, acl) so the line would read defaults, acl 0 0. If you needed to change /etc/fstab, either unmount and remount your partition if it is not in use or reboot. Substitute 65537 for the first subordinate UID that you created, and /home/containeruser for the user that will be running the containers. lxc.network.hwaddr = 00:16:3e:a1:b2:c3 - We want MAC addresses to be assigned from the pool starting with 00:16:3e which is the OUI for Xen. We could use whatever we want here, but it is good to use something that is allocated for virtual interfaces. lxc.id_map = u 0 65537 65536: This tells LXC to map UID 0 in the container to UID 65537 on our host. This number corresponds to the first subordinate UID we specified in /etc/subuid and the beginning of the range in the usermod command. The last number tells LXC that it has 65536 subordinate UIDs to work with. This number corresponds to the number of subordinate UIDs we allocated in /etc/subuid and to the end of the range in the usermod command. lxc.id_map = g 0 65537 65536: This is the same as the last line but with subordinate GIDs instead of subordinate UIDs. This tells lxc-create (the command used to create LXC containers) to use the download template and make a container named (-n) test. No actual container will be made here because of the template options we are using. The two dashes (--) after the name are there because everything after those two dashes are template options. The only option we want here is to list (--list) which templates are available. This asks lxc-create to give us the help (-h) for download templates (-t download). This will create a container called DebLXCTest from the download template. We specified that we want the Debian distro (-d debian), the Jessie release (-r jessie), and AMD64 as the architecture (-a amd64). Unfortunately when I went to start it, networking would not work. I got a message that said the veth interface could not be created (Operation not permitted). I have a feeling this has something to do with cgroups, and I spent several hours trying to diagnose the issue to no avail. When I removed the networking options from the container, it started up just fine. When I ran it as root with networking, it worked just fine. I do not think it is an SELinux issue because I did not notice any SELinux warnings in the logs, and I even disabled SELinux just to see. I was able to get things working in Ubuntu using the instructions found here, so it could be a systemd issue or a kernel issue. I think that containers are a really interesting concept. However, right now, I do not think they are going to replace VMs anytime soon. While containers are lightweight and easy to spin up and destroy, I think the implementation is too new. 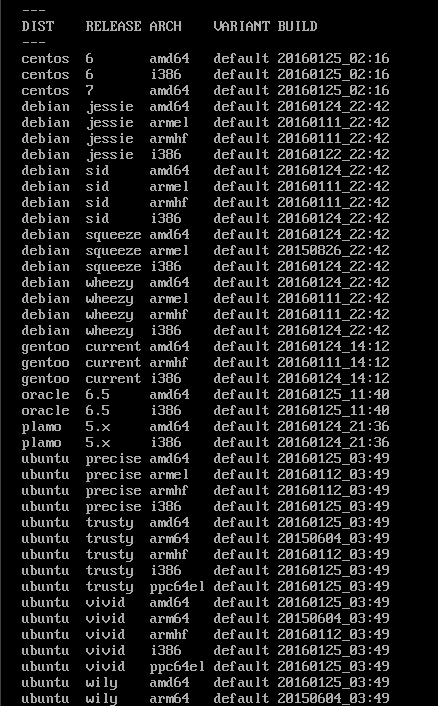 As you can see, it took us a lot of work to get unprivileged containers to work in anything other than Ubuntu. Even then, it required very new packages that are not available everywhere. I do not like the idea of running containers as root because if the container is compromised or misconfigured, it could lead to compromise of the system that the container is running on. With VMs, the user running the VMs typically is not root. This means that if an attacker can break out of a VM, they might compromise other VMs but it would take more work to compromise the system. Unprivileged containers are a great step forward in terms of security with respect to containers. When other Linux distributions catch up to have everything in place to support them, I think I could get behind them more. Containers are lightweight and do not require the overhead of a separate operating system installation. That means you can get more containers on a given hardware configuration than VMs (depending on the VMs). Containers are arguably more portable than a VM because they are typically smaller (because they do not have the OS install overhead) and you do not need to worry as much about converting them for use with different hypervisors. For example, if you want to use a VMware VM on VirtualBox or KVM, you have to convert it and deal with any virtual hardware driver issues that may arise. Containers can be spun up and destroyed very quickly which means that you could use them to serve customer requests to your web application for example. Spinning up and destroying a VM takes more time and is more suitable for more permanent use. By default, Docker and LXC containers run as root which can lead to system compromise if the container is compromised or misconfigured. Getting unprivileged containers working on any Linux distribution other than Ubuntu may be more work than is worth the effort. Hopefully this will change soon. If you have a mixed operating system workload (i.e. Linux and anything other than Linux), you cannot put the non-Linux operating systems in containers (you would need a VM or bare metal for that). What are your thoughts? Do you use containers for anything? Please let me know.